Patients with Charcot-Marie-Tooth disease showing the greatest increase in speed appear to respond to and utilize the energy storing and releasing properties of a carbon fiber composite ankle foot orthosis differently from those who had smaller increases in walking speed. One of the approaches often prescribed for the treatment of more severe weakness is orthotic bracing, typically bilateral ankle foot orthoses (AFOs) to compensate for muscle weakness in the leg.6-12 Bracing is typically prescribed when muscular weakness progresses to the point of foot drop, which interferes with normal gait patterns. Traditional AFO braces are made out of plastic with little or no capacity for energy storage and release. They are often bulky and therefore disliked by patients.13,14 The lack of ability to store and release energy may also limit the functional assistance provided by the AFO. 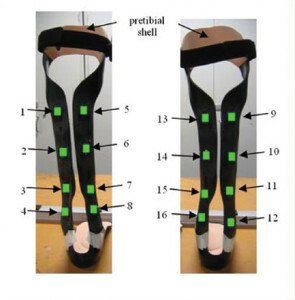 Therefore, our research group sought to explore the energy and storage release characteristics of a contemporary custom carbon fiber AFO on gait effectiveness.15,16 The construction of the AFO allowed the user to lean into the pretibial shell so they could load the brace without concern of losing balance and falling forward. We sought to document the magnitude of load and, concomitantly, relate the mechanical characteristics of the AFO to walking function. Figure 1. Instrumented carbon fiber AFO. Numbers represent location of strain gauges on instrumented AFOs. Strain gauges were placed medially and laterally across the top, middle, and bottom (ankle) of the brace. Numbers refer to specific locations and strain measurements. Five male patients (mean age, 58.8 ± 8.1 years; height, 175.8 ± 7.5 cm; weight, 79.4 ± 11.9 kg) and three female patients (50.7 ± 11.9 years, 168.3 ± 2.9 cm, 89.0 ± 23.8 kg) diagnosed with CMT and who exhibited bilateral foot drop granted institutionally approved written consent to participate in the study. All volunteers could freely ambulate without use of any assistive devices. The men averaged 1.2 years of AFO use, while the women averaged 4.3 years of AFO experience. Three participants had been fitted previously with the custom carbon fiber AFO used in the study, while the others were in the process of being fitted with the test AFO. The three individuals who were experienced with the AFO were given a duplicate set of braces that were instrumented with eight 350 Ω Omega strain gauges (Figure 1) for the purpose of measuring the mechanical responses of the brace during locomotion. The same certified prosthetist-orthotist (CPO) fabricated and fitted each brace, with clinical decisions made based on observation of the person’s gait, weight, and muscle strength as tested manually, observed ankle deformity, and personal experience of the CPO with respect to both CMT in general and the individual patient. Each AFO was constructed using layers of bidirectional carbon, bidirectional carbon-Kevlar, and an epoxy matrix to form a vacuum. The AFO is considered a posterior spring brace because the primary structure is at the back of the leg. 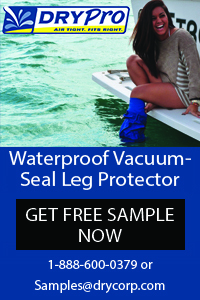 It then wraps around to the anterior portion of the leg and is secured with a strap (Figure 1). It was anticipated that this design would allow the participant to lean into the brace when walking without the consequence of a fall, with brace stiffness varied based on individual patient needs. Figure 2. Relationship between ankle joint strength (left and right limbs averaged) and walking velocity. Greater increases in walking velocity braced vs unbraced (S2, S8) appeared to be related to individuals with less ankle joint strength. BW = body weight. After being fitted with their custom AFOs, all participants had a minimum of 10 weeks of accommodation to the braces prior to data collection. We initiated data collection with measurement of plantar flexor and dorsiflexor strength, using a manual force transducer. Next, markers were placed on 16 selected lower extremity anatomical landmarks for motion capture. Each participant walked through a 10-m calibrated experimental test area at a self-selected velocity, stepping on force platforms midway across the 10-m walkway. Participants first walked in an unbraced condition, followed by a braced condition in which they wore their custom AFOs. 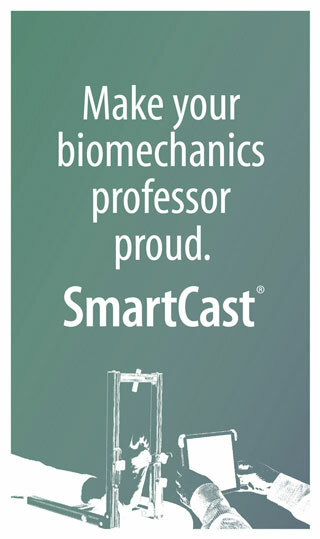 We used inverse dynamics procedures to calculate joint moment and joint power values during gait. The three participants with prior experience with the custom AFOs (S1, S2, S4) wore the instrumented braces during the locomotion test; the other five participants wore devices that were not instrumented. 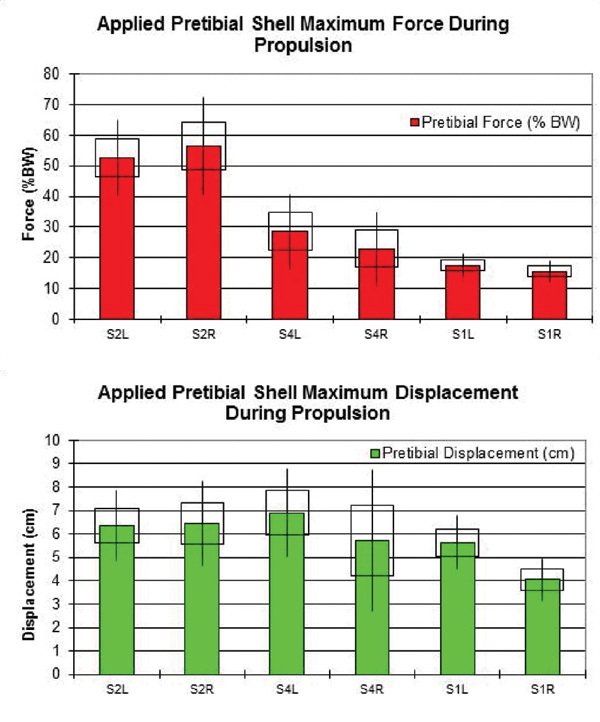 Using data gathered from the instrumented braces, we examined the efficacy of loading the pretibial shell of the AFO. Due to the clinical nature of the study, all data were examined statistically on a single subject basis using the Model Statistic17 technique (α = .05). Figure 3 Percent AFO strain for respective participants (S2: top, S4: middle, S1: bottom) during the support phase of gait. Most participants appeared to lean into the top of the brace (highlighted in red), as illustrated by greater strain values during the propulsive phase of gait. Results of the inverse dynamics procedures are provided elsewhere15 and are not the focus of this report. Generally, there were significant differences between braced and unbraced walking with regard to the support moment at loading response for 10 of the 16 limbs studied. Ankle joint extensor moment values at propulsion were generally greater for those who walked at a faster velocity in the test brace condition. Most participants (75%) walked significantly faster in the braced condition than the unbraced condition (Table 1). 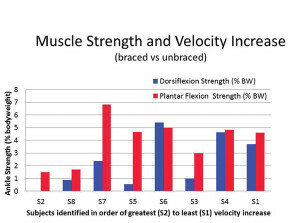 There was a moderate inverse relationship observed between change in walking velocity and plantar flexor and dorsiflexor strength (r = -.823 and r = -.708, respectively; Table 1). This result suggests that participants with less ankle joint strength exhibited greater improvement in walking velocity, which was optimized with use of the AFO. These results are presented graphically in Figure 2. It can be observed that participants with a greater increase in walking velocity (braced condition vs unbraced condition) appeared to have less ankle joint strength than those whose velocity increase was less pronounced. The experiential level of participants with the brace may have influenced these results. Specifically, such outcomes are inconclusive because those with previous brace experience had equivocal velocity outcomes (Table 1). Three study participants used instrumented braces. The intent of the instrumented brace was to determine dynamic functional performance during brace use and to assess whether the hypothesis of leaning into the brace was supported. Several sites were instrumented on the brace, including the top, middle, bottom, and ankle, both medially and laterally (Figure 1). The AFO strain throughout the support phase of gait by participant and limb are presented in Figure 3. The top and middle portions of the braces elicited higher strain values during the propulsive phase of gait. 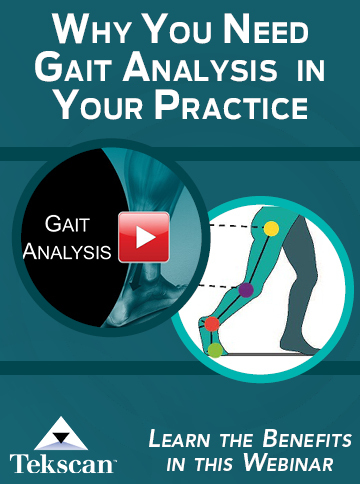 Collectively, these data suggest that participants relied on the support provided by the AFO during the propulsive phase of gait. Maximum force and displacement of the pretibial shell of the AFO are given by participant in Figure 4. These mechanical results support the hypothesis that the brace stored (via force) and returned (via displacement) energy back to the leg of the individual during walking. Figure 4. 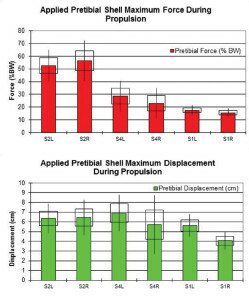 Maximum pretibial shell force (top) and displacement (bottom) exerted by each participant during the propulsive phase of gait. One (rectangle) and two (bar) standard deviation values are given. Participants are ordered from greatest (S2) to least (S1) gain in walking velocity braced vs unbraced. L: left leg, R: right leg. The first outcome of this study, suggesting that participants walked faster braced than unbraced, is in contrast to the work published by Ramdharry et al.4 We suggest this difference is the result of the custom AFO used in this study, which improved several gait characteristics,15 as well as its mechanical characteristics. This allowed participants to walk faster after a period of accommodation to the AFO. It should be noted that, in the work of Ramdharry et al, the comparison groups were unique: CMT patients who used AFOs versus those who did not. Our project used a within-subject design that compared braced versus unbraced walking for each individual. The instrumented brace provided data and insight not yet reported in the orthotic and prosthetic arena. Dynamic strain assessment is both novel and insightful as a means of assessing how individuals function in their AFOs. Three participants were evaluated, with their data presented in Figure 4. We acknowledge the limitations of the small sample; however, the consistent trends among the three participants support the observations discussed. We suggest and encourage others to continue to explore the outcomes presented here. It can be observed from the strain data that there are individual responses to the use of the AFO, yet there also are trends. S1 and S2 tended to lean into the brace in both the mid and top regions, while S4 showed greater strain values across the top region of the AFO (Figure 3). Generally, these results support the hypothesis that participants tended to lean into the brace during propulsion. This validates the design of the AFO, in which struts provide energy storage as the wearer leans into the brace. Energy storage was determined by measuring the amount of strain that occurred when the participants used the instrumented braces and calculating the amount of force required to produce this amount of strain based on engineering laboratory tests and modeling procedures. The participants demonstrating the greatest increases in speed appeared to respond to and use energy-storing and releasing properties of the carbon fiber composite AFO differently from the individuals who showed lesser changes in walking velocity. This suggests that, among CMT patients, preferences for an increase in walking speed combined with the extent of muscle weakness may influence the ability to benefit from the mechanical properties of the AFO. The relationship between AFO design for energy storage and release and the biomechanical needs of the CMT patient appear to be complex, especially since CMT is often progressive and individuals may present with bilateral differences in muscle strength, as was the case for some of the patients in our study. Further research and design efforts may make it possible to conceive a single design that allows the stiffness to be varied, much as adjustable-heel-height prosthetic feet are marketed to meet the varying needs of individuals with lower extremity amputations. Any type of AFO is only of value to CMT patients if it is utilized. Vinci and Gargiulo18 reported relatively poor compliance with brace use (20%) across a group of 25 patients diagnosed with CMT. Reported feedback from their study participants included “hating them” and not being ready to accept that the braces may be helpful. Another possible source of noncompliance is aesthetics. The AFOs used in the present study were easily accommodated by the participants’ own footwear. In addition, the custom design facilitated an intimate fit of the entire brace to the contours of the foot, ankle, and leg, which made it virtually unnoticeable when wearing pants or slacks. This aspect, as well as the noticeably improved function during walking, suggests that the brace used in the current study would likely lead to greater compliance than that reported by Vinci and Gargiulo. This study was designed to test the hypothesis that a custom-fitted carbon fiber composite AFO would improve support during the loading response and enhance propulsion during late stance. The results of our mechanical testing indicated that both can be achieved using a brace that provides ankle stiffness and facilitates the storage of energy during loading and release of energy during propulsion. The participants showing the greatest increase in speed appeared to respond to and utilize the energy storing and releasing properties of the carbon-fiber composite AFO differently from the individuals who showed lesser increases in walking speed. This suggests that, among CMT patients, preferences for an increase in walking speed combined with the extent of muscle weakness may make certain mechanical properties of an AFO more desirable than others. It is important to address the biomechanical needs of a CMT patient, since there may be bilateral strength differences due to progression of the disease. Optimizing the mechanical (energy storage and return) characteristics of the AFO to patient needs can be challenging. Until understanding of these relationships can be improved, one strategy may be to design AFOs of varying stiffness and allow patients to experience a range energy storage and release characteristics prior to selecting the stiffness they prefer. Alternatively, further research and development efforts may make it possible to conceive a design which allows the stiffness to be varied. Janet S. Dufek, PhD, FACSM, is associate professor and CoRE (collaborative research and education) Fellow at the University of Nevada, Las Vegas (UNLV), and codirector of the Biomechanics Laboratory. Edward S. Neumann, PhD, PE, CP, FAAOP, is Professor Emeritus in the Department of Civil and Environmental Engineering and Construction at UNLV. M. Cameron Hawkins, PhD, is a lecturer in the Department of Mechanical and Biomedical Engineering at Boise State University in Idaho. Brendan O’Toole, PhD, is a professor in the Department of Mechanical Engineering and director of the Mendenhall Innovation Program and the Center for Materials and Structures at UNLV. Disclosure: This research was supported by Applied Research Initiatives grant #NSHE-08-76, University of Nevada, Las Vegas, the Hereditary Neuropathy Foundation, and Ortho Rehab Designs, Las Vegas, NV. None of the authors has any financial or personal relationships with other people or organizations that could inappropriately influence their work. detail_charcot_marie_tooth.htm. 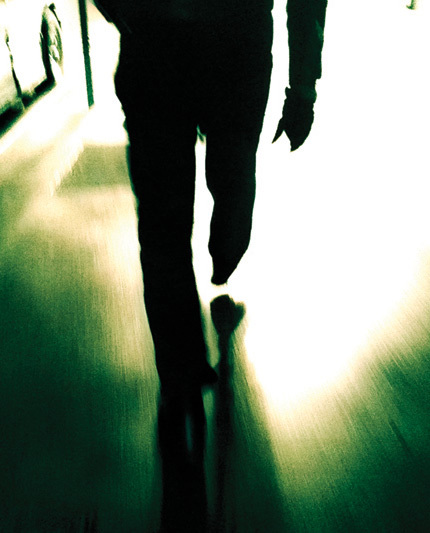 Published April 2007. Accessed January 29, 2014. 2. Newman CJ, Walsh M, O’Sullivan R, et al. The characteristics of gait in Charcot-Marie-Tooth disease types I and II. Gait Posture 2007;26(1):120-127. 3. Don R, Serrao M, Vinci P, et al. Foot drop and plantar flexion failure determine different gait strategies in Charcot-Marie-Tooth patients. Clin Biomech 2007;22(8):905-916. 4. Ramdharry GM, Pollard AJ, Marsden JF, Reilly MM. Comparing gait performance of people with Charcot-Marie-Tooth disease who do and do not wear ankle foot orthoses. Physiother Res Int 2012;17(4):191-199. 5.Taniguchi JB, Elui VM, Osório FL, et al. Quality of life in patients with Charcot-Marie-Tooth disease type 1A. Arq Neuropsiquiatr 2013;71(6):392-396. 6. Meinders M, Gitter A, Czerniecki JM. The role of the ankle plantar flexor muscle work during walking. Scand J Rehabil Med 126(1):998;30(1):39-46. 7. Sutherland DH, Cooper L, Daniel D. The role of the ankle plantar flexors in normal walking. J Bone Joint Surg Am 1980;62(3):354-363. 8. Kepple TM, Siegel KL, Stanhope SJ. Relative contributions of the lower extremity joint moments to forward progression and support during gait. Gait Posture 1997;6(1):1-8. 9. Hof AL, Nauta J, van der Knaap ER, et al. Calf muscle work and segment energy changes in human treadmill walking. J Electromyogr Kinesiol 1992;2(4):203-216. 10. Neptune RR, Kautz SA, Zajac FE. Contributions of the individual ankle plantar flexors to support, forward progression, and swing initiation during walking. J Biomech 2001;34(11):1387-1398. 11. Sadeghi H, Sadeghi S, Prince F, et al. Functional roles of ankle and hip sagittal muscle moments in able-bodied gait. Clin Biomech 2001;16(8):688-695. 12. Bean J, Walsh A, Frontera W. Brace modification improves aerobic performance in Charcot-Marie-Tooth disease: a single-subject design. Am J Phys Med Rehabil 2001;80(8):578-582. 13. Lunsford T, Ramm T, Miller J. Viscoelastic properties of plastic pediatric AFOs. J Prosth Orthot 1994;6(1):3-9. 14. Wan YZ, Zak G, Naumann S, et al. Study of 2.5D glass-fabric-reinforced light curable resin composites for orthotic applications. Composites Sci Tech 2007;67(13):2739-2746. 15. Dufek JS, Neumann ES, Hawkins MC, O’Toole B. Functional and dynamic response characteristics of a custom composite ankle foot orthosis for Charcot-Marie-Tooth patients. Gait Posture 2014;39(1):308-313. 16. Hawkins MC. Experimental and Computational Analysis of an Energy Storage Composite Ankle Foot Orthosis [dissertation]. Las Vegas: University of Nevada Las Vegas; 2010. 17. Bates BT, James CR, Dufek JS. Single subject analysis. In: Stergiou N, ed. Innovative Analyses of Human Movement. Champaign, IL: Human Kinetics; 2004:3-28. 18. Vinci P, Gargiulo P. Poor compliance with ankle-foot-orthoses in Charcot-Marie-Tooth disease. Euro J Phys Rehabil Med 2008;44(1):27-31. The authors say” Traditional AFO braces are made out of plastic with little or no capacity for energy storage and release. They are often bulky and therefore disliked by patients.13,14″.